Here are some progress photos of my jacket. I’ve been working on the outer portion, and sew far so good. Please forgive the wrinkles. It really does look better on me than on the dressform, and I am very pleased with the fit. If you click on the picture for a larger view, you can see that the belt loops came out kind of small. I forgot to add a seam allowance for them. 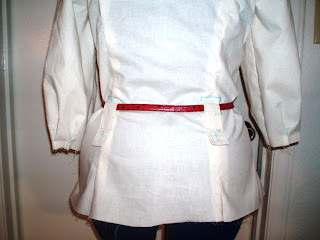 So I will add a 1/4″ seam allowance to the belt loops. I just realized that I will have to add a seam allowance to the sleeve cuffs as well. I thought the pockets came out okay. One was a little crooked. 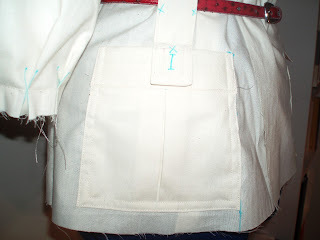 The blue “X”s indicate stitching I will omit. Or I might keep it. I have to keep reminding myself that this is my jacket, and it doesn’t have to look exactly like the model. Overall, I am very pleased with how this jacket is turning out. I really didn’t know what to expect from a BWOF pattern. I had concerns that I did not trace the pieces out correctly, or they wouldn’t go together smoothly. As I mentioned before, the fit is really good, and I believe this jacket will turn out to be one of my favorite projects. 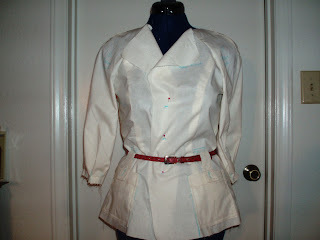 Up next is the collar and sewing the outer portion to the lining. Wow, you’re making great procress, I can’t wit to see the finished jacket.